Our European Umbrella Bases make a decorative addition to any patio umbrella. 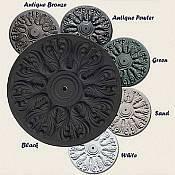 These beautiful, durable, and popular European cast iron bases will last for years to come thanks to their resin-hardened composite design. Base comes with a short tube and a long tube to ensure that it can fit under most any table. Both tubes are 1-5/8 inches in diameter. The short tube is 6-1/2 inches tall and the tall tube measures 13 inches high. Available in six versatile colors.